Internet is flooded with rich videos resources. What if you find some amazing videos and want to capture these streaming videos to the portable devices for playback on the go, when you are waiting in line at the bank, on a trip or riding on the metro where no internet is accessible. You may want to download the online videos or convert URL to video, for sure. It is a commonplace when you find you have to download videos to MP4, as MP4 is one of the most widely used video format among mobile devices while keeping relatively high quality. However, not that rich resources are ready for downloading. Take YouTube for example, it is a popular video site which hosts hundreds of videos but no downloading option is available. In fact, there is hardly a place offering the specific download link you want, not to mention the conversion you need as the they seldom happen to be MP4 if you are lucky enough to download them. Rather than struggling to try different ways to search for a right place to download and a right tool to convert online videos, to convert URL AVI to MP4 directly can save much energy and time. Does it sound like turning an apple into a pen? On the contrary, it is actually quite a simple task, as long as you get the help of a right URL to MP4 converter for Mac. 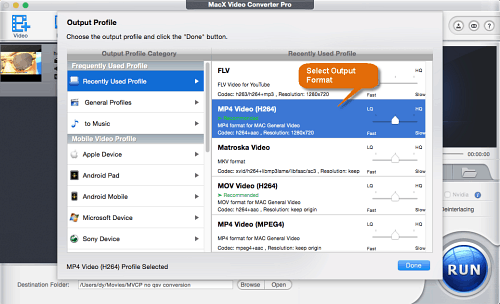 Here we highly recommend MacX Video Converter Pro. This video converter offers an easy solution for users to download YouTube URL as well as URLs of various other popular video sharing sites and convert them to MP4 on Mac with excellent quality. What users have to do is get the URL of the videos. Besides, you can not only convert URL videos to MP4, but also convert URL to AVI, MOV, FLV, WMV, MKV and various other video formats as well as audio formats like URL to MP3, AAC, iPhone Ringtone, AC3, WMA and etc for playback on kinds of mobile phones and tablets like iPhone, iPad, Android etc. Continuing with YouTube example, the URL to MP4 conversion is actually a process consisted of two stages: download URL video and convert downloaded URL videos to MP4. Users can follow the following step-by-step guide to convert YouTube online video URL to MP4. Free download this URL to MP4 converter for Mac or for Windows. Then run it. Hit "YouTube" button and click "analyze" to load the YouTube video details by copying and pasting the wanted video URL from YouTube. Or click "paste & analyze" button, this YouTube URL video downloader will automatically detect the YouTube videos on the opening website page. Here we choose MP4 as output format from the format list. You can also change audio and video parameters as you wish. Note: you can choose various other video formats, like YouTube to MOV, FLV, AVI, WMV etc. Besides, rich portable device profiles are also provided, with which you can convert YouTube to iPhone, iPad, Samsung Galaxy S9, Kindle Fire, HTC 10, Xbox, PS4, etc. directly with excellent quality. Click the "Browse" button and choose the location where you would like to save your converted MP4 files. Click "RUN" button and the URL to MP4 video converter for Mac/Win will automatically start to download and convert YouTube to MP4. You can enjoy the URL videos on the portable devices you have in secs. You can convert Instagram to MP4, Vimeo to MP4, Dailymotion to MP4 and many other online URL video to MP4. As per the steps above on converting URL to MP4, you can freely convert URL to video as you like, such as VEVO video from YouTube, Hindi romantic video songs and etc to MP4, MOV, AVI, FLV, MPEG4 etc with the excellent quality for playback on mobile devices iPhone, iPad, Android, Samsung, WP8, PS4 etc.